Misericordia University is holding the fourth annual Mother's Day Champagne Brunch to benefit the student mothers of the Ruth Matthews Bourger Women with Children Program (WWC) on Sunday, May 12 in Sandy and Marlene Insalaco Hall. The Bourger WWC Advisory Board is hosting the event. It will help provide tuition support for student mothers in the program. The menu includes scrambled eggs, Potatoes O'Brien, cinnamon vanilla French toast, bacon, sausage, a waffle station, granola, yogurt, fruit, Viennese pastries, muffins, Caesar salad, ham carving station, roasted turkey, mustard glazed salmon, sautéed green beans, tortellini a la vodka, and an assortment of desserts. Coffee, tea and soft drinks will be served, along with Champagne, and mimosa and Bloody Mary cocktails. A special children's buffet will feature macaroni and cheese, chicken fingers, cheese hot dogs, corn and French fries. Doors open at 10:30 a.m. and seating begins at 11 a.m. There will be a Silent Auction and a "Parade of Baskets" raffle, with some baskets offering more than $500-worth of prizes. A pre-sale on tickets for the "Parade of Baskets" is on Friday, May 10 from 10 a.m. to 3 p.m. in the lobby of Insalaco Hall. "The brunch is a very special way to support our student mothers by honoring all mothers," said Katherine Pohlidal, director, Bourger WWC. "The Bourger Women with Children Advisory Board hopes to increase awareness of the program and help our student mothers lower their tuition debt load. It is great to see so many families come together for such a worthy cause. It is a beautiful event and a very worthwhile way to spend that very special day." Tickets are $50 per adult and $20 for children 12-18 years of age. Children under 12 are free. Due to limited seating, reservations are required. Online registration is available by visiting cougarconnect.misericordia.edu/wwcbrunch19. For more event information or to register by telephone, please call Kim Caffrey, Office of Mission Integration, at 570-674-1877. Established in 2000, the Bourger WWC provides housing and support for academically qualified, single mothers at the poverty level and their children at three houses owned by Misericordia University. The program, one of only eight of its kind in the country, has seen baccalaureate degree graduates continue their education in graduate school and in careers including nursing, education, communications, occupational therapy, social work, medical imaging, psychology, business administration and speech-language pathology. The program has housing for 16 single mothers and their children. Although priority is given to women from Luzerne and Lackawanna counties, students from as far away as Montana and Missouri are currently enrolled. For more information about the Bourger WWC Program at Misericordia University, please call Katherine Pohlidal, director, at 570-674-6728 or log on to www.misericordia.edu/wwc. Misericordia University is hosting the fourth annual Mother's Day Champagne Brunch to benefit student mothers in the Ruth Matthews Bourger Women with Children Program on Sunday, May 12. To register, please call 570-674-1877. 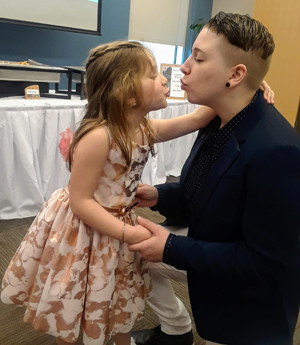 Pictured are Bourger Women with Children student Rochel Ahern and her daughter, Leora, sharing a kiss during the 2018 brunch in Sandy and Marlene Insalaco Hall.